Carpentry is a skilled trade in which the primary work performed is the cutting, shaping and installation of building materials during the construction of buildings, ships, timber bridges, concrete formwork, etc. 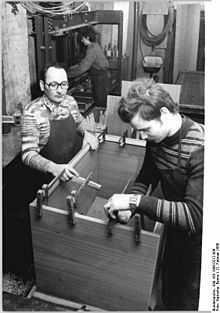 Carpenters traditionally worked with natural wood and did the rougher work such as framing, but today many other materials are also used and sometimes the finer trades of cabinetmaking and furniture building are considered carpentry. Carpentry in the United States is almost always done by men. With 98.5% of carpenters being male, it was the fourth most male-dominated occupation in the country in 1999, and there were about 1.5 million positions in 2006. Carpenters are usually the first tradesmen on a job and the last to leave. Carpenters normally framed post-and-beam buildings until the end of the 19th century; now this old fashioned carpentry is called timber framing. Carpenters learn this trade by being employed through an apprenticeship training—normally 4 years—and qualify by successfully completing that country's competence test in places such as the United Kingdom, the United States, Australia and South Africa. It is also common that the skill can be learned by gaining work experience other than a formal training program, which may be the case in many places. Relatively little information about carpentry is available from pre-history (before written language) or even recent centuries because the knowledge and skills were passed down person to person, rarely in writing, until the printing press was invented in the 15th century and builders began regularly publishing guides and pattern books in the 18th and 19th centuries. The oldest surviving, complete architectural text is Vitruvius' ten books collectively titled De architectura which discusses some carpentry. 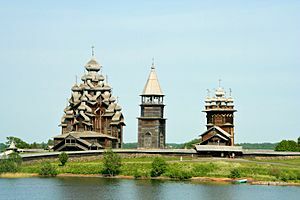 Some of the oldest, surviving, wooden buildings in the world are the temples in China such as the Nanchan Temple built in the year 782, the Greensted Church parts of which are from the 11th century, the stave churchs in Norway from the 12th and 13th centuries. Carpentry requires training which involves both acquiring knowledge and physical practice. In formal training a carpenter begins as an apprentice, then becomes a journeyman, and with enough experience and competency can eventually attain the status of a master carpenter. Today pre-apprenticeship training may be gained through non-union vocational programs such as high school shop classes and community colleges. Informally a laborer may simply work alongside carpenters for years learning skills by observation and peripheral assistance. While such an individual may obtain journeyman status by paying the union entry fee and obtaining a journeyman's card (which provides the right to work on a union carpentry crew) the carpenter foreman will, by necessity, dismiss any worker who presents the card but does not demonstrate the expected skill level. Carpenters may work for an employer or be self-employed. No matter what kind of training a carpenter has had, some U. S. states require contractors to be licensed which requires passing a written test and having minimum levels of insurance. Formal training in the carpentry trade is available in seminars, certificate programs, high school programs, online classes, associate degree programs, and advanced college degrees in the new construction, restoration, and preservation carpentry fields. Sometimes these programs are called pre-apprenticeship training. In the modern British construction industry, carpenters are trained through apprenticeship schemes where general certificate of secondary educations (GCSE) in Mathematics, English, and Technology help but are not essential. However, this is deemed the preferred route, as young people can earn and gain field experience whilst training towards a nationally recognized qualification. There are two main divisions of training: construction-carpentry and cabinetmaking. During pre-apprenticeship, trainees in each of these divisions spend 30 hours a week for 12 weeks in classrooms and indoor workshops learning mathematics, trade terminology, and skill in the use of hand and power tools. Construction-carpentry trainees also participate in calisthenics to prepare for the physical aspect of the work. 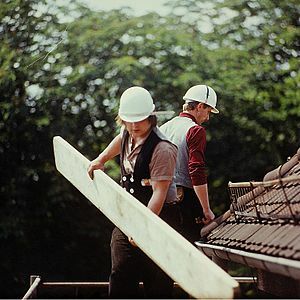 Upon completion of pre-apprenticeship, trainees who have successfully passed the graded curriculum (taught by highly experienced journeyman carpenters) are assigned to a local union and to union carpentry crews at work on construction sites or in cabinet shops as First Year Apprentices. Over the next four years, as they progress in status to Second Year, Third Year, and Fourth Year Apprentice, apprentices periodically return to the training facility every three months for a week of more detailed training in specific aspects of the trade. Tradesmen in countries such as Germany and Australia are required to fulfill a formal apprenticeship (usually three to four years) to work as a professional carpenter. Upon graduation from the apprenticeship, he or she is known as a journeyman carpenter. Carpenters traditionally worked with natural wood which has been prepared by splitting (riving), hewing, or sawing with a pit saw or sawmill called lumber (American English) or timber (British English). Today natural and engineered lumber and many other building materials carpenters may use are typically prepared by others and delivered to the job site. In 2013 the carpenters union in America used the term carpenter for a catch-all position. Tasks performed by union carpenters include installing "...flooring, windows, doors, interior trim, cabinetry, solid surface, roofing, framing, siding, flooring, insulation, ...acoustical ceilings, computer-access flooring, metal framing, wall partitions, office furniture systems, and both custom or factory-produced materials, ...trim and molding,... ceiling treatments, ... exposed columns and beams, displays, mantels, staircases...metal studs, metal lath, and drywall..."
The Centre Pompidou-Metz museum under construction in Metz, France in 2009. The building possesses one of the most complex examples of carpentry built to date and is composed of 16 kilometers of glued laminated timber for a surface area of 8,000 m². Carpenter Facts for Kids. Kiddle Encyclopedia.